MANSFIELD, Mass. – In the playoffs, winning and losing games generally comes down to execution in crucial moments. That is especially true when it is two league rivals that know each other well and would love to advance at the other’s expense. After King Philip traveled to Alumni Field and knocked out Mansfield 6-5 with a strong second half comeback in the Div. 1 South first round game, the one word that both coaches used to define why the Warriors came out on top was execution. Mansfield coach Tim Frias was blunt in his assessment of the second half. He said, “They didn’t make mistakes and we made a lot of mistakes. They did very well and they had a great game plan going into it. The Hornets were executing early and built a 4-2 lead at the break. In fact it took only 44 seconds for Jarrett Saunders to open the scoring with a low angle shot that snuck past Paul Macrina. KP nearly tied it late in the first with a great passing move in transition only to have Harry Fallon hit the post. With 2.4 left in the quarter, Billy Grant made it 2-0 with a shot from straightaway that Macrina got a piece of and appeared to have kept out, only to have the ball trickle past him and over the line. KP responded in the second quarter to tie it. John Deluca got the first with a shot that bounced over the head of Mansfield goalie Sean Powers (15 saves). Fallon tied it with 6:04 left to halftime when he snared a rebound and went behind his back to find the top corner. Mansfield again found late goals to regain the lead. Ryan Smith was involved in both, scoring the first when he snagged a loose ball on the edge of the crease and then taking advantage of a bad turnover to assist on a goal by Sam O’Connell, who matched Fallon with the creativity of his finish. Coming out of halftime, the Warriors took control of the game. KP would score the next four goals between the third and fourth quarters to take the lead, while its defense continued to shut down the Mansfield attack. Even when the Hornets did get chances to possess the ball, they rushed their chances and allowed KP to heap even more pressure on the Mansfield defense. Kravitz credited Macrina for sparking his team at the break. The junior goalie followed up his halftime team talk with a stellar showing in the second half, making nine of his 11 saves to regularly deny the Hornets another goal. “I see it all the time,” said Kravitz with a smile. “He’s just always that good and he’s a great person too. Anthony Truini got the comeback started with a lefty shot to the bottom corner on the run within the first minute of the third quarter. With three minutes left in the third, Sam Agricola popped up in transition off an assist by Zach D’Amico to tie the game at 4-4. Early in the fourth quarter Agricola struck again off an assist from Deluca. He sniped the top corner to make it 5-4. Seven minutes later, Tim Watson forced a turnover in the attacking zone and fed Agricola for another rip into the corner to make it 6-4. Grant took advantage of a man-up situation to fire in his second of the game and cut the lead back to one. With 1:04 remaining, Jon Reed had one last chance for the Hornets to try and tie it. He was open on the edge of the crease and had time to throw several fakes but Macrina still managed to read the play and stuff the chance. 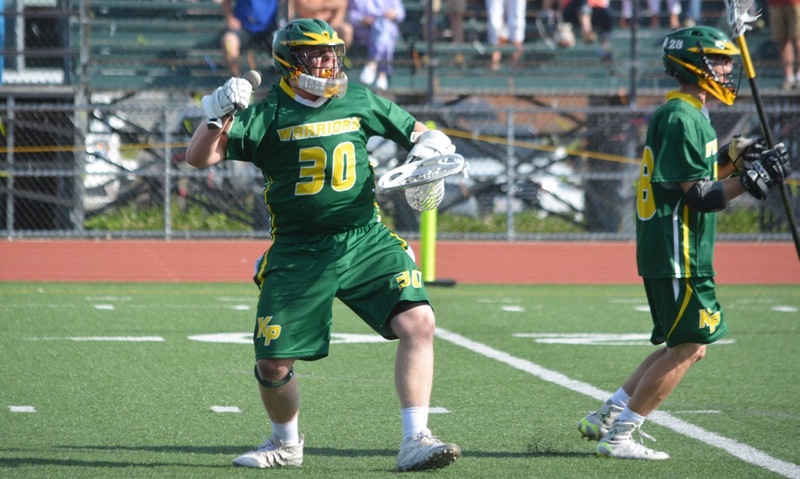 King Philip (11-8) will face the winner of Newton North and Natick in the quarterfinals. NORTH ATTLEBORO, Mass. – The Hornets got off to a great start against Kelley-Rex rival North Attleboro in a non-league meeting on Friday afternoon. Behind two of Bill Grant’s three goals, Mansfield took a 4-0 lead in the first half and that turned out to be the difference. 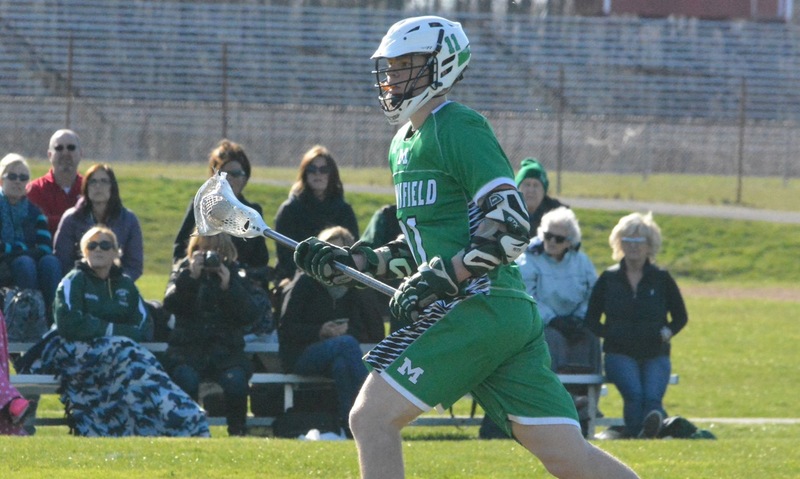 The Rocketeers closed the gap with a fourth quarter rally but in the end the early deficit proved to be too much and Mansfield held on for an 8-5 victory. North Attleboro coach Kevin Young, whose young team only has three seniors in the starting lineup, admitted that the lack of intensity at the start hurt on Friday. He said, “That class last year was nice and strong, carried the load, so these guys have to step up and learn and they are. The second half was good…made a push at the end. Grant opened the scoring inside the opening minute off a feed from Connor Finerty. 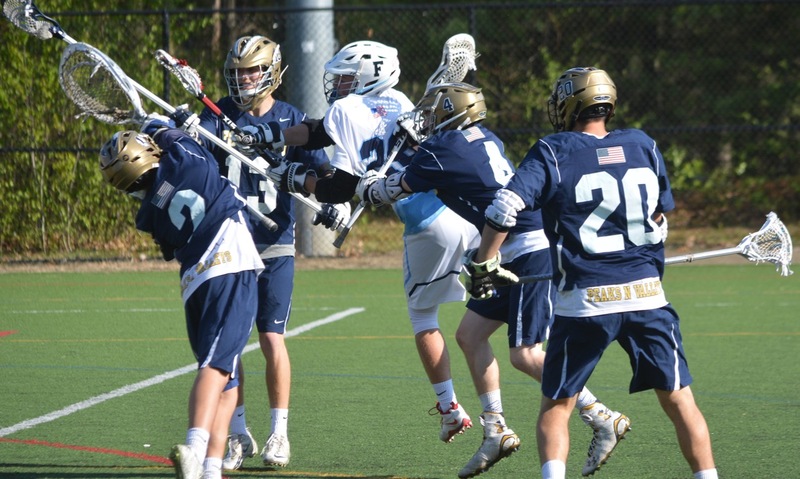 The score would stay the same for nearly seven minutes before Grant won a ground ball and then fed it to Ryan Smith, who had his first shot saved by Danny MacDonald but batted in the rebound. Sam O’Connell made it 3-0 for the Hornets before the end of the first quarter off a great pass from Jon Reed from the ‘X.’ The Mansfield passing moved the North defense around and got MacDonald to chase out of his crease for a second to allow space in front for O’Connell. North had a few chances in the first quarter. Sean Powers made three of his seven saves in the half and the Rocketeers hit the post twice, including a chance for Zack McGowan that smacked off the bar from close range. One shot by Owen Costello slipped past Powers but the muddy field held the ball just short of the line and the goalie was able to cover in time to prevent the goal. Grant tacked on his second goal of the game on a man-up three minutes into the second quarter, but North was finally able to get on the board on its own EMO when freshman Nick Ward fired a shot inside the post. In the second half, Finerty restored the four-goal lead on an assist by Hunter Ferreira, as the senior cut through the middle of the North defense. On a turnover, Ferreira got his first to make it 6-1 and it looked like Mansfield could run away with the game. But, North had an answer. Costello beat his man to the middle and despite heavy contact was able to get a shot away and beat Powers. Shortly after, Colin Young beat the Mansfield defense in transition after a strong clear and made it 6-3. The North defense started to clamp down after the break and limited the chances for the Hornets and was aided by MacDonald, who made five of his nine saves in the second half. The defense could only hold out so long, as Grant beat his close defender with a head fake to the back of the cage and then a spin move into the middle before depositing his shot to MacDonald’s left to complete his hat trick. Smith fed Reed for his second goal of the game to make it 8-3, but North did not give up and managed to cut into the lead with a pair of quick transitions in the final minute. McGowan beat his defender and then finished just under the bar and then Collin Young tacked on his second on a man-up in the final 30 seconds to cut the lead to three. Frias admitted he was starting “down the path” to being nervous as North scored two quick goals, but he was proud of his team’s strong start to the season. Mansfield (4-1) will face Hanover on Tuesday, while North Attleboro (2-2) will travel to Taunton.